A couple, played by Andrea Riseborough and Andrew Gower, drive along a deserted tundra road singing along to the club music which, along with their cigarettes, is the only reminder of their strobe-lit soiree. Then these two, linked superficially, share a harrowing connection welding them in trauma. The pair are party to two accidental homicides fifteen years apart, with their aged guilt resonating narratively (their absence from each other’s lives since the first incident) and in character developments (the male driver has since begun attending Alcoholics Anonymous). The makeup, hair, and postures of both convey time’s passage without excess, allowing emotional exhaustion to do the heavy lifting. While nothing is thicker than the blood they’ve spilled, their brogues come awfully close, so their conversation is less important than the visual storytelling accompanying them. Gower’s character is a mess of mismatched layers, while Riseborough’s has shaped up and moved on, with a husband, child, and accelerating career. Her clean, modern home and workplace directly combat the physicality of what she’s done and, when a scruffy reminder of her past wanders in, it’s removed with clumsy (yet efficient) speed. While two doesn’t necessarily fall into the “serial” category, there certainly is a proficiency for dumping bodies on display. This proficiency, as well as a knack for being in the wrong place at the wrong time, begins to involve an insurance agent (Kiran Sonia Sawar) who uses a Corroborator (a device accessing the memories of claimants, witnesses, or whomever, basically) to make sure everything is on the up-and-up. The memory of an accident and the memory of a crime may be chronologically close, but the agent doesn’t know that as she starts her investigation. Directed with unflinching, up-close grotesquery by John Hillcoat, the moment the inevitable collision occurs in the mystery is panicky chaos that allows both actresses ample opportunity to impress while we desperately wish to be anywhere but with them. 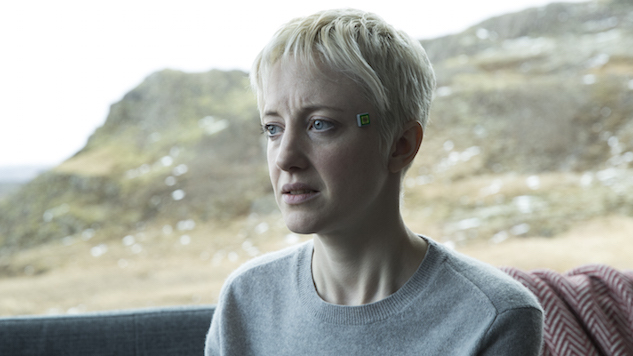 The twist twists, and in Black Mirror fashion, the episode follows its logical conclusion down a dark alley—where it promptly bludgeons it. It’s written well enough that the dread precedes the groans, with dominoes falling in perfectly-timed acceleration. However, there’s still enough overkill that this cautionary tale about slippery slopes gets more than a bit silly before it ends—especially the bleak usage of “We Could Have Been Anything That We Wanted To Be” from kid crime-musical Bugsy Malone. The unrelenting pessimism at the heart of the story, that our choices damn us and we are complicit in our damnation, becomes so suffocating that the story becomes less “Oh, no!” and more “That, too?”—especially if the episode’s title is in reference to the tears spilled by Riseborough’s killer.